Teachers who say they get included in school decision-making and collaborate often with other teachers areÂ more likely to say that teaching is a valued profession in their society. Â In turn, these same teachers report higher levels of job satisfaction and confidence in their ability to teach and to motivate students, according to a 2013 survey of Â middle-school teachers in 34 countries and regions around the world conducted by theÂ Organization for Economic Co-operation and Development (OECD) and published on June 25, 2014. “Those who get to participate and collaborate have a higher feeling of value,” saidÂ said JulieÂ Belanger, an education analyst at theÂ OECD and an author of theÂ 2013Â Teaching and Learning International Survey (TALIS). Whether this perception of value directly affects actual student performances is unclear, at least from the survey results.Â Â Analysts did not find a tight correlation between teachers feeling valued by society and students scoring high on the OECD international test known as PISA. * Â Teachers in some high performing nations felt valued, teachers in other high performing nations felt undervalued. In Singapore, for example, where students score very Â high on the PISA test, nearly 70 percent of teachers felt that the teaching profession was valued. In Finland, another high performing nation, it was nearly 60 percent. But in Japan, whoseÂ students score among the top 10 of the world, only 28 percent of teachers felt their profession was valued. In Poland, another high performing nation, only 18 percent did. In the United States, which ranked 36th in math and 24th in reading in the most recent (2012) PISA test, only about a third of teachers said they felt part of a valued profession, a sliver above the international average of 31 percent. But in every country, the teachers who said their profession is valued in society tended also to report that their schools include them in decisions and that there was a positive collaborative atmosphere with other teachers at their school. Â “They have the highest job satisfaction and confidence in their teaching abilities,”Â said Belanger. 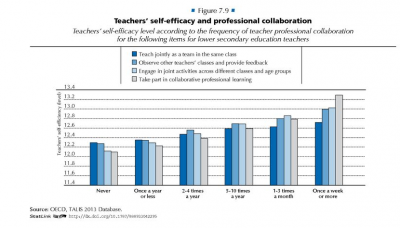 “It’s true across the board.” Â The graphic on the upper right corner, Figure 7.9 from the TALIS report, shows that the teachers who collaborate more feel more confident about their teaching abilities. Click on it to see a larger version. The TALIS report highlightedÂ a number of concrete ways that schools can foster collaborative workplaces. For example,Â veteran teachers could formally mentor new teachers. Instead of sending teachers away to one-off workshops for professional development, schools could form networks of teachers. Teachers could collaboratively research topics of interest to them to improve theirÂ skills. The TALIS survey included class sizes, but OECD analysts found no correlation between class size and job satisfaction. Indeed, some of the higher performing nations with the highest teacher job satisfaction rates have some of the larger class sizes. The TALIS report found that the size of a random class in the United States wasÂ 27 students, compared with 36 in Singapore and 32 in Korea. More important to teacher satisfaction than class size Â is the type of student in his classroom. The more behavioral problems and low-peforming students in the class, the more unhappy a teacher was. But the OECD also said these negative effects were mitigated in schools that had a supportive, collaborative atmosphere to help teachers handleÂ behavioral disruptions. Interestingly, analysts also found no correlation between class size and behavioral disruptions. In other words, larger classes were not necessarily more difficult. This second TALIS survey was the first year that the United States participated in the OECD teacher survey. For a more detailed report of AmericanÂ teachers, click here.